Cardiff Dragons are focused on their Wales v Scotland netball clash at Cardiff Met University next Saturday. Glasgow-based Strathclyde Sirens are visitors to South Wales, the second time Dragons have played a Vitality Superleague fixture at their training headquarters. The match has been dubbed ‘Celtic Clash II’ and head coach Tania Hoffman says: “It’s a fantastic venue for the match against Sirens. Captain Nia Jones and her Dragons have played all home games at the Sport Wales National Centre in Cardiff this season, but have opted for a one-off switch to the Cyncoed Campus. Action: Thunder v Dragons. Pic: Mark Pritchard. The change of venue means additional tickets are available following two 650-plus sell-out matches SWNC. Dragons’ lost 73-46 in their latest outing at Belle Vue Sports Village in Manchester. Home team Thunder won the first three quarters, scoring 58 goals, before Dragons finished strongly to come out on top 17-15 in the final period. Ruthless Thunder are top of Superleague and managed to get all 12 of their players out on court for the second time in a week. Manchester were dominant in possession against sixth-placed and the Liana Leota-Kathryn Turner combination was effective, topped off with some superb shooting from Joyce Mvula, Thunder looked ruthless. Dragons’ attacking combination of Bethan Dyke and Kalifa McCollin looked a threat at times, but the visitors could not stop the flow of Thunder goals. Coach Hoffman’s Dragons were able to establish themselves a little more in the final quarter. They made fewer mistakes and were able to take advantage of a couple of Thunder errors. It was an outstanding performance across the board for all of the Manchester shooters, firing at an incredible 94 per cent overall. Mvula held a 100 per cent record during her time on court, bagging an impeccable 24 out of 24, and the others missed only five shots between them. Teams, Manchester Thunder: Joyce Mvula, Kathryn Turner, Liana Leota, Caroline O’Hanlon, Laura Malcolm, Emma Dovey, Kerry Almond. Replacements: GS Eleanor Cardwell, GK Rebekah Airey, WD Amy Carter, GA Ali Thomas, GD Paige Kindred. Celtic Dragons: Chelsea Lewis, Kalifa McCollin, Bethan Dyke, Kyra Jones, Nia Jones, Dee Bolakoro, Stacian Facey. Replacements: Abby Tyrrell, Lucy Herdman, Lucy Howells, Clare Elsey, Ellie Nawele. Quarter-time scores (Thunder first): 20–12; 20-8 (40-20); 18-9 (58-29); 15-17 (73-46). Dragons’ captain Nia Jones speaks to team-mates during a huddle. Saturday 13 v Strathclyde Sirens (home, 4pm; to be played at Cardiff Metropolitan University’s National Indoor Athletic Centre, Cyncoed Campus). Tickets for ‘Celtic Clash II’ at Cardiff Met on Saturday, April 13 can be purchased from celticdragonsnetball.ticketline.co.uk and there is a 10% discount for groups in multiples of 10. Contact Ticketline directly on 0161 813 2222. 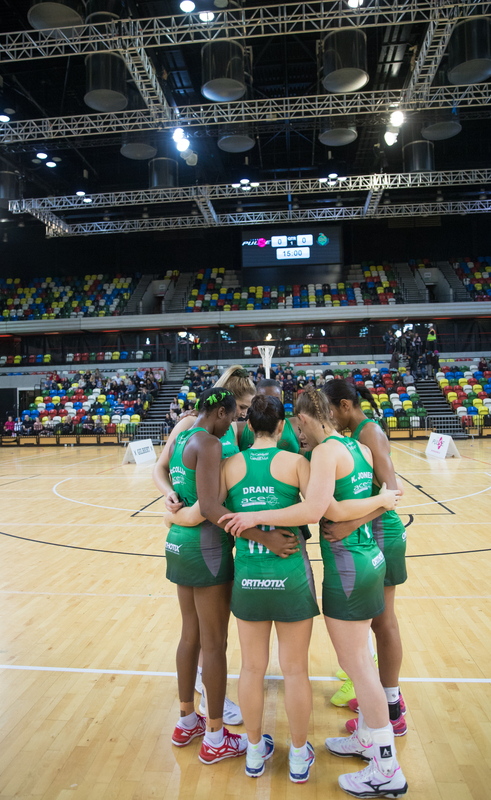 Vitality Netball Superleague results: London Pulse 62, Saracens Mavericks 59; Manchester Thunder 73, Celtic Dragons 46; Severn Stars 49, Strathclyde 40; Wasps 61, Team Bath 46. Monday fixture (April 8): Loughborough Lightning v Surrey Storm (7pm). Live on SkySports.